Autism in Paradise: What the ??? Wow. Just wow. So now rather than a medical condition, autism is a form of mental illness that leads to homicidal rages. I’m not sure where to begin, but I’d have to start by pointing out the obvious to Joe—yes, a lot of these types of tragedies do have to do with mental health. Is that really such a leap? But why would he think “someone a bit further on the autism scale” would engage in a murderous rampage? Why the baseless assertion that “more often than not” the perpetrators of these hideous crimes are autistic? Joe mentions he has a son with Asperger’s that “everyone loves”, as if this makes him an expert on the autism “scale”. It frightens me that there are people unfamiliar with autism that heard this nonsense and take it as credible evidence autistic people are a danger to society—heck, Joe said it and he has a kid with autism so he should know. There is enough misinformation about autism without labeling those afflicted as homicidal maniacs. 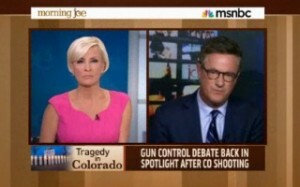 Yo, Joe—Get your facts straight before you disinform millions who watch you. Maybe even take the time to learn something about autism. Having a son on the spectrum, or as you would say, “scale”, doesn’t give you the right to slander an entire group of people—many who can’t speak for themselves.